Vitamin B6 benefits many of your body's necessary physiological functions as a coenzyme for many different enzyme dependent conversions of amino acids and hormones throughout the body. Vitamin B6 can is a necessary component of neurotransmitter production in the brain, such as serotonin, GABA and dopamine. It is also required by the liver to produce detoxification binding proteins such as cysteine, Glutathione, and metallothionein. Vitamin B6 helps to maintain hormone balance in women by aiding in the production of hormones, while also aiding the liver's ability to detoxify excess estrogen from the blood, helping to improve the balance of estrogen and progesterone. Vitamin B6 can therefore aid in the treatment of PMS, menstrual cramps, and infertility in women of child bearing years. What does Vitamin B6 do? Vitamin B6 has so many functions in our bodies, it is hard to list them all in comprehensive way. B6 is mostly found in the body in the form pyridoxal-5-phosphate, which is the active form of B6. Most dietary supplements use the pyridoxine form of vitamin B6, which needs to be converted in the Liver into P5P (pyridoxal-5-phosphate) before it can be used in its many, many functions throughout the body in numerous enzymes and metabolic pathways. Vitamin B6 is necessary to help convert tryptophan into niacin (Vitamin B3) as well as to help convert tryptophan into Serotonin, the major mood regulating neurotransmitter in our body. Pyridoxal-5-Phosphate is also a necessary coenzyme in the converion of Tyrosine into Dopamine, which is also a major neurotransmitter which helps us with focus, memory, and also improving our mood. Detoxification of heavy metals, pesticides, pain medications such as tylenol, and many other environmental toxins is dependent on Liver enzymes which require Vitamin B6 in order to function. The number one antioxidant in the body is Glutathione and is responsible for binding to heavy metals such as Mercury, Copper, xeno-estrogens such as paint solvents, pesticides, paint fumes, perfumes, household cleaners, nail polish remover, and the environmental pollution due to excess birth control use which contains synthetic estrogen into our drinking water and ending up in the fish that we eat. 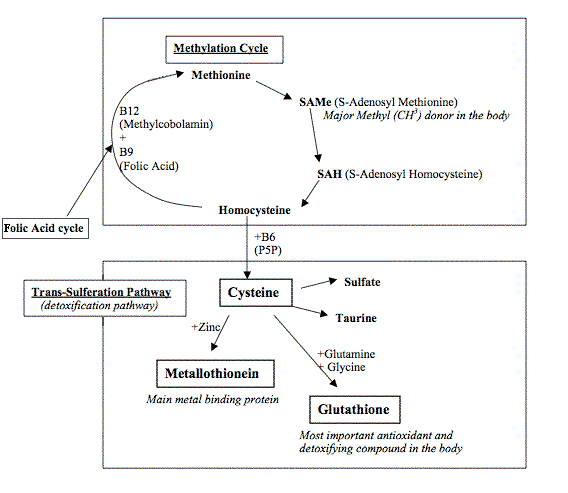 Glutathione is made from 3 amino acids: Glutamine, Glycine, and Cysteine, with Cysteine being the most important to get in abundance, since it contains the thiol, or Sulfhydryl group which allows Glutathione to bind to heavy metals, pesticides, and protect every cell membrane from oxidative stress and free radicals. Since Cysteine is the main component for Glutathione production, Vitamin B6 is extremely important. As you can see in the diagram above, P5P (pyridoxal-5-phosphate) which is the active form of Vitamin B6, is required by two separate enzymes in order to convert Homocysteine, which is a component of the "Methylation cycle", first into cystathione, and then again B6is required to convert cystathione into Cysteine. If your body has a Vitamin B6 deficiency, as in the condition " Pyroluria " then your liver will be unable to convert homocysteine into cysteine, and therefore you will be lacking the precursor to many essential molecules such as Glutathione, Metallothionein, Taurine, and other sulfate compounds which chelate heavy metals out of the body, and help to repair our intestinal lining. Vitamin B6 deficiency is therefore implicated in disorders such as Autism, Alzheimer's, Parkinson's, Lou Gehrig's disease, ADHD, Hypertension and even Cancer, which can all be a result of Environmental toxins such as Mercury, Lead, Aluminum, Copper, pesticides, VOC's, and man others which we are in constant contact in our modern industrialized cities. If you have a certain kind of genetic disorder which prevents you from being able to convert Pyridoxine into P5P (pyridoxal-5-phosphate), then you are even more likely to suffer from the health consequences of heavy metal toxicity and the presence of xeno-estrogens and numerous other environmental toxins. You should therefore take nutritional supplements which contain the P5P activated form of B6 and not the Pyridoxine form. Vitamin B6 deficiency is most commonly due to a combination of inadequate dietary food sources of Vitamin B6, and a condition known as pyroluria. Pyroluria was first discovered in schizophrenics who had a certain compound known as the "Mauve factor" showing up in their urine samples. As many as 80% of schizophrenics tested positive for this "Mauve factor". Mauve factor was later identified as Kryptopyrrholes which were metabolic byproducts of fats and proteins that were not properly broken down. These pyrroles strongly bind to Vitamin B6 and also Zinc, and carry them out of the body through the kidneys and into the urine. These people are now known as pyrolurics and they suffer from chronic Vitamin B6 deficiency as well as Zinc deficiency, another extremely important mineral in the production of neurotransmitters and deetoxification proteins such as metallothionein. Zinc directly antagonizes Copper, Mercury, Cadmium, Aluminum and Lead and is also extremely important in the production of adrenal hormones, insulin, and testosterone in men and women. If you have pyroluria, than you are much more likely to have autism, mood disorders such as Bipolar, anxiety, depression, schizophrenia, addictions such as alcoholism, as well as menstrual disorders such as PMS, dysmenorrhea, and migraine headaches, since the lack of Zinc and Vitamin B6 will directly result in a buildup of Copper toxicity in the Liver and brain, as well as a decreased ability to detoxify Mercury, Lead, Arsenic, Aluminum, and Cadmium, which can all degenerate brain tissues, resulting in neuronal cell death, giving rise to poor memory, and eventually Alzheimer's or Autism can result from an excess of these toxic metals building up in the brain tissues. At the same time, Vitamin B6 and Zinc are necessary for the enzymes which create the neurotransmitters Serotonin, Dopamine, Melatonin, and GABA, and so the constant leaching of B6 and Zinc into the urine will result in mood swings, anxiety, panic disorders, rage disorders, addictive tendencies, insomnia, and ADD. By supplementing with adequate amounts of Zinc and P5P form of Vitamin B6, you can help to reverse the dangerous effects of this common disorder. Even if you do not test positive for kryptopyrroles in the urine, stress and the environmental toxicity which leads to our chronic exposure to heavy metals in our water, air, and food supply, will all require us to have much more of these vital nutrients than we can adequately derive strictly from food sources of Vitamin B6 and Zinc.